Good morning everyone - happy March, and happy Sunday! Yeah, Sunday. Today's the first day of the third term, and thanks to my brand-new term schedule, I don't teach class today until after lunch. I do have other responsibilities this morning, but not until 11:10 which isn't for another two hours. I feel the need for all this bolding because these changes are still very much bold in my mind. How on earth am I going to spend such a long and empty morning every Sunday for the rest of the year? Well, I think I'm off to a good start: printing and stuffing envelopes for a hopefully fun and definitely gimmicky start to the new term, and listening to the Yale Glee Club sing major works on Youtube. So uh, nothing to argue with so far. It seems that Jordan has decided to welcome in the new term with a rather aggressive showing from the weather department: the weekend was beautifully sunny and warm, and when I left my apartment at 8:15 it felt more like noon. Can't say I'll argue with the shift, sudden though it is...but I hope this doesn't represent a general upward trend, because at this rate we'll be downright tropical by mid-April. So, third term, huh? It feels different than the last new beginning in December, which had me flashing back nostalgically to my earliest days at King's. I'm excited to try some new things with these classes now that I feel like I have my sea legs; to kick off today, they're getting an envelope containing a single piece of paper on which is written "Who are you?" Is that exciting enough? Hope so. Whatever. I miss my second-term kids, but we had a relatively short time together, especially since it was broken up by the winter break, and now that I've had two groups of kids I feel a bit less attached to the individual ones. I'm also starting to know more and more of the students who make their way into my class, and these groups contain some of my favorite kids (and some who I've heard are pains, but what fun would it be without that). You'll hear plenty about the new classes as the term continues! Last week, the last of term 2, was pleasant and uneventful enough. Classes were very smooth as we wrapped up our philosophical explorations, and I taught the Glee Club a spiritual instead of working on the song we've been practicing, because I felt like it. Here's some food. 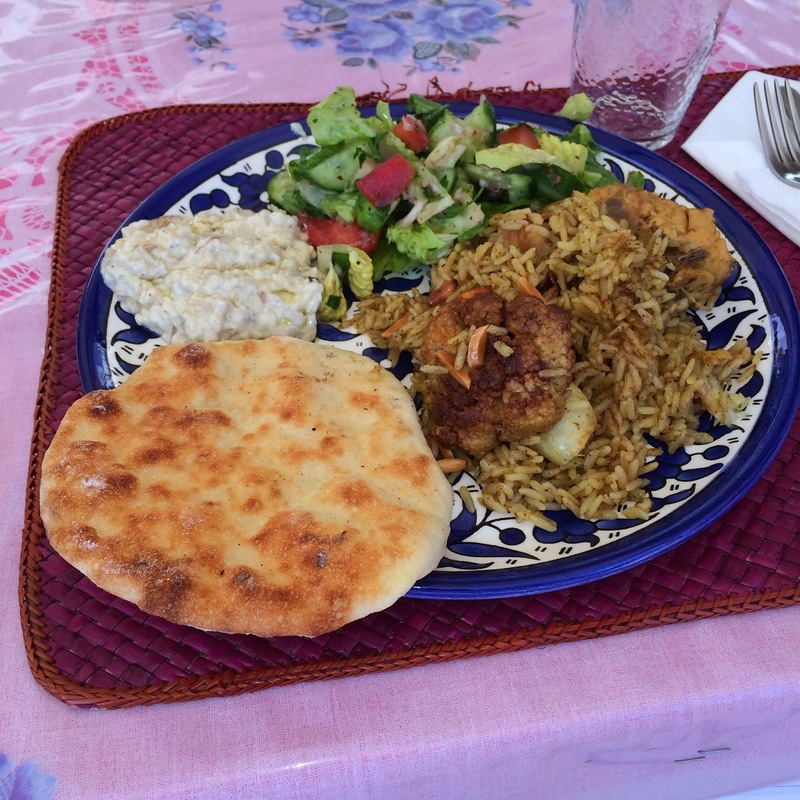 A meal at Beit Sitti, the cooking class/restaurant that I went to in October. Delicious as always, and stay tuned - I'm planning to do an Official Food Blog Post on a Real Food Blog about this very meal! So consider this a taste, if you will. Sorry about that one. 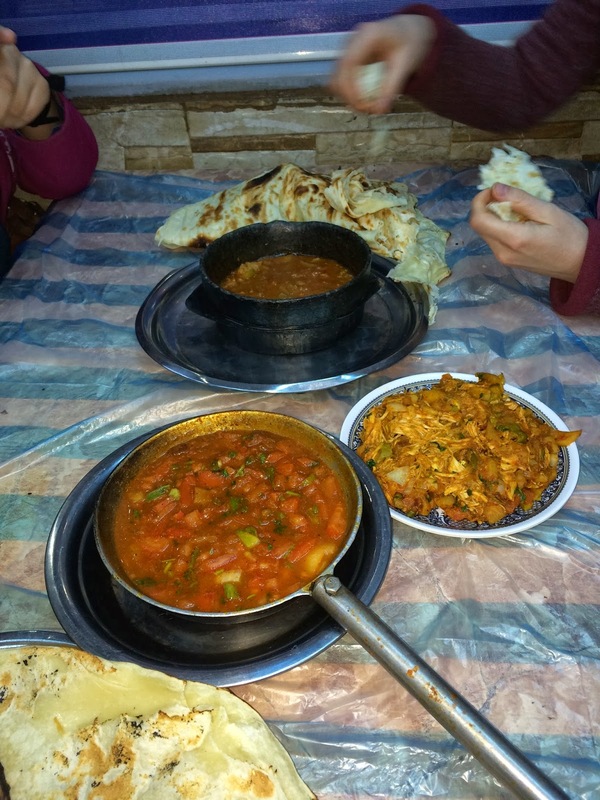 And here's the fare from a Yemeni place we visited the same day as Beit Sitti; it was a pretty excellent weekend for food overall. Basically you just rip off pieces of the bread and put it in one of those bowls and have yourself a great time. After a somewhat troubling time navigating ourselves through Amman to get to this place, it was well worth it. 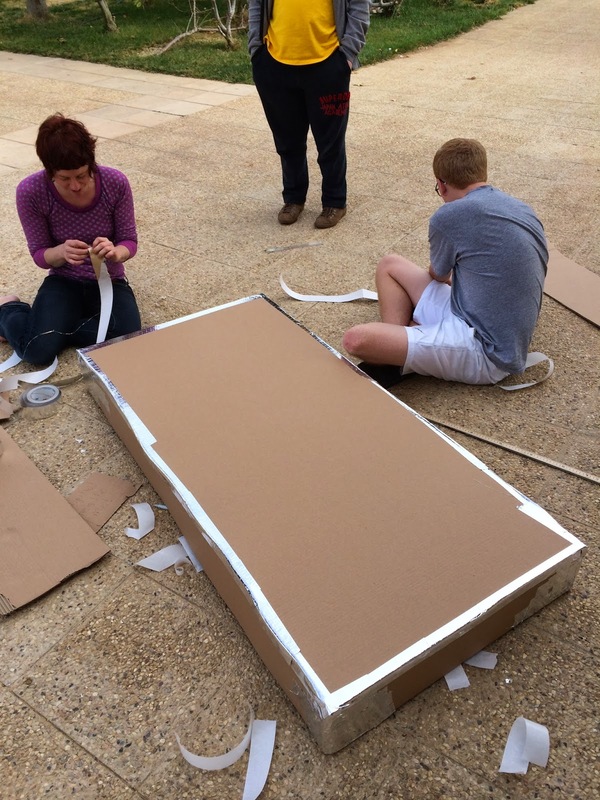 And yesterday we built a cardboard boat! The annual Cardboard Boat Race is tomorrow so I thought I'd include a teaser. It promises to be hilarious, if nothing else. Our boat is called the H.M.S. Hubris and looks like a rectangle. We're going to win. And last but certainly not least in the "The Past" department, I now feel ready to show off the final project that a student partner and I put together for this term of Arabic. Look how much we've improved! It's all in Arabic, but trust me, you'll be able to get the gist. And we didn't even lose points for including exclusively non-Arabic music! As the strains of the Duruflé Requiem continue to waft from my computer speakers, I'm thinking about the impending spring, and how we got here. Two-thirds of the way through the first year of teaching; one week from spring break and the family trip to Istanbul (!!! ); done with January and February, which seem generally acknowledged as the toughest months of the school year. Frankly, I thought they went pretty quick. About 100 minutes to go until my first actual obligation of the day, and look how much has already been done! I can fill these mornings with all kinds of adventures. You're bored now though, because I haven't actually had any adventures yet. Be patient. We've got three months to go, and tomorrow I'm seriously considering getting up at 3 to watch the Oscars. So let's get this March Madness started!